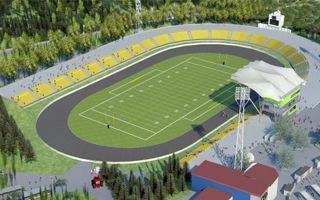 Thorough redevelopment of the dated athletic/football stadium in Lublin (lying right beside the larger speedway/football stadium) envisages replacement of the main grandstand. Still based mostly on sloped land, it will discretely incorporate the main building with facilities for sportsmen. 6 rows of seating will provide capacity of 1,400 under cover and with floodlights placed atop the roof. The size will hardly be comparable to previous capacity of this stadium, but remaining landfill sections on west and north sides will not be renovated. This more modest approach is still enough to get Category IIIA from IAAF, which allows to host major youth tournaments and even some international meetings. Reconstruction will take 2 years and consume PLN 36.8 million. Majority of the budget will be put forward by the Lublin municipality, while Polish Sports and Tourism Ministry will provide 10 million.